Happy New Year! Please note our gym is open today from 12:00 PM to 1:30 PM for the official “Mad Dog” workout and start of the 30 Day MAD-Uary Fitness Challenge. Todays workout is open to all levels and is a great opportunity to start your New Year on a positive and challenging note. We will be joining for a Prayer Circle at approximately 12:15 PM to pray for the continued health and wellness of our friend Greg Madsen. The Prayer Circle will be lead by Bishop Britain Wilson. Note: This workout will be conducted between Krav Maga and HQ. Please be at the gym promptly at 12:00 PM if you want to participate. All levels are welcome! Congratulations to Alex and Dorie Spencer! Congratulations to Alex and Dorie SPENCER on their marriage! 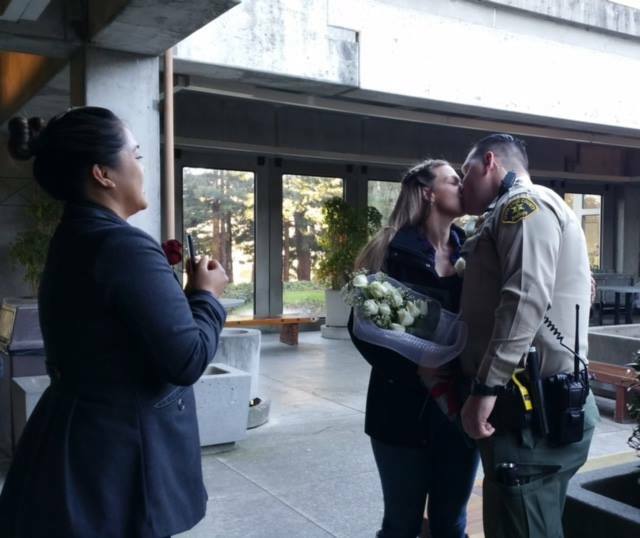 Alex and Dorie were married On December 30, 2015, at the Santa Cruz County Courthouse. We are all so happy for you both, and are grateful to have been part of your journey together. May God continue to bless your new family with health, happiness, love and joy. We love you guys!